Over the weekend I had the pleasure of welcoming author Jasmine Silvera back to the GSMC Book Review Podcast for Episode 80 (astute readers might be wondering what happened to Episode 79? Never fear! That's the link for that episode, it just happens to be a non-interview episode). 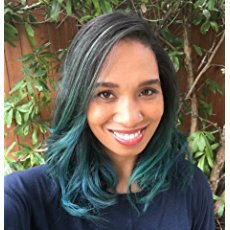 Jasmine was one of my first guests on the podcast; the first time was almost a year ago when we talked about her debut novel, Death's Dancer, on Episode 17. She came back this time to talk about the second book in her Grace Bloods series, Dancer's Flame. With the help of a god, Azrael and Isela exposed a conspiracy within and altered the world’s balance of power. But for Azrael, victory comes with dangerous new powers he can't control. Will accepting his future mean losing everything he’s gained — his allies, his territory, and his consort? Isela’s found a home when she stepped into Azrael’s protection, and his arms. But if accepting her new role as consort means giving up the life she’s worked for will the price be too high? Dancer's Flame picks up where Death's Dancer left off. I don't want to give too much away from the first book if you haven't read it, but part of the arc of this second book is watching Azrael's and Isela's relationship continue, and evolve, after the happily ever after of that first book. We also learn more about Azrael's cohort and Isela's family. Getting more of the world and the characters I grew to love in the first book. I'm so happy this is a series so I can continue on with them for awhile! The arc of Azrael's and Isela's relationship. During the interview Jasmine said that she writes what she knows, and while she doesn't know what it's like to be in a supernatural relationship, she does know what it's like to be in a long-term relationship, and all of the pros and cons and challenges that go into making that relationship work. Some couples argue about money, Isela and Azrael argue about how to keep each other safe with a variety of supernatural beings trying to kill them. But it boils down to the same elements of communication and trust. All of the other relationships in the story. There are a LOT of secondary characters, but all of them serve a purpose and have a place within the story, and it's both fun and fascinating to watch as all of those relationships intertwine and evolve, and what that means for the rest of the characters. "[Azrael] would not define her by their relationship, yet he put it between her and the vast unknown of what she had become. Once she had been a loose end, even among her own large and complicated family. "She would rebuild. She always did. That was the key to immortality - being able to start again no matter how many times you must." "'All godsdancers have something special, something that makes them different from any other dancers,' she said firmly. 'Trouble is, nobody knows quite what it is. You can only train so far. It's why so many who begin fail to advance. And you, Isela Vogel, were the best of the best.'" 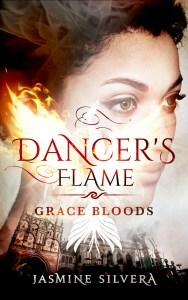 Do you want to get involved in the world of the Grace Bloods and read Dancer's Flame? Today is your lucky day because we have a giveaway! Jasmine has been kind enough to provide 3 copies of Dancer's Flame and one of them could be yours! All you have to do is go to either our Facebook, Twitter, or Instagram pages and comment on the post with Jasmine's interview. It's as simple as that: just comment on Episode 80 on Facebook, Twitter, or Instagram, and you'll automatically be entered to win Dancer's Flame! The last day to enter is May 19th and winners will be announced on May 21st. To hear the interview with Jasmine, please click here.